When you are climbing a mountain, sometimes you slip and fall a bit. This season, we are climbing toward the National Qualifying Tournament and we slipped against a solid Doane team. Doane opened the scoring in the first half with a free kick that beat Flames keeper Jackie Swanger's outstretched hand. The Flames were able to bounce back in final minutes of the first half with a goal by King. Turco crossed the ball from the right and King was able to strike it past the keeper at the near post. At the half, we talked about maintaining our discipline and playing simple, basic soccer. Good defense and offense. 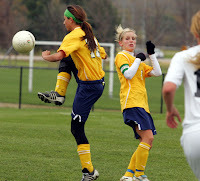 Unfortunately, we made some defensive mistakes and the Tigers were able to capitalize with 2 goals in the second half. Samantha Extrom from Doane scored all 3 of the Tiger goals. Doane had 14 shots, CSM 7. Swanger had 4 saves and Ludwing from Doane had 1. CSM had 3 corner kicks. On the field, CSM was unable to get their possession game going and it seemed like we were chasing the game for long moments instead of controlling the game. It is disappointing to take a hit like this at the end of such an incredible season. I am sure that we will bounce back and take our game to the next level. The next step is the MCAC Tournament hosted by CSM. I am thinking that we will play at noon on November 6th. The championship game will probably be at 1:00 PM on November 7th. The winner of the tournament goes on to the National Qualifying Tournament in Dallas, November 10-13. The winners of the MCAC, Frontier Conference and Gulf Coast Conference goes to Dallas along with the next 3 teams with the best Longo points. CSM is in the mix, so if we perform well, we hope to get to Dallas, where anything can happen. See you then. With a 9-0 CSM win over York, the Flames wrapped up their 12th MCAC Conference Championship. In conference play, the Flames outscored their opponents 17-0. The girls played sharp and had a stubborn defense. Swanger played in goal in the first half and had to make 2 saves. Jones in goal the second half made 4 saves. York had 7 shots and CSM, 29. The Flames will host the MCAC Tournament in 2 weeks. Next opponent is Doane at our house, 4 PM the 27th of October. See you there. The second half was looking like a Bellevue party when out of nowhere Sara Berens was able to beat her player on the right flank and get deep into the box with about 9 minutes to go into a 0-0 tie with Bellevue. Sara crossed it with her right foot. We had numbers in the box but the ball went over Melissa King's head. Ramsey Miller was able to shoot it on goal. Save by the Bellevue keeper! But wait, the ball went right to the Flames Cindy Fibich, who shot it. The keeper got a hand on it but pared it within reach of Melissa King who knocked it home from about 3 yards out. GOOOOAALLLLLLLL! Seriously, the goal came against the run of play in the second half. Bellevue was having all the possession and the Flames were chasing the game. However, CSM had a moment of brilliance to turn the game in their favor. 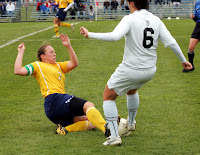 The last minutes of the game, the Bellevue Bruins tried to attack with a series of long balls. CSM was up to the task and were able to thwart the aerial attack and shutout the Bruins. CSM had a good first half but was unable to match the energy of the Bruins for a majority of the second half. I feel fortunate to beat the Bruins and hope that we play better the next time we face them. With a win next weekend vs York, the Flames will host the conference tournament for the first time in 3 years. Let's hope the Flames capitalize on their good fortune versus a much improved York squad. Swanger played the whole game in the Flames goal making 6 total saves. Our other Keeper Mollie Jones was out for most of the week with illness but was available at the game. Allyssa Valquier was unable to attend the game due to illness. Other Flames have also been battling illness this week. At the end of the game, any feelings of sickness turned to joy with the big win. Shot totals: CSM 10 shots. Bellevue, 8 total shots. Bellevue's keeper had 6 saves also. It is a big win for the Flames who now have a few days off over their fall break. Hopefully we will be ready to come back and finish the season strong! The visiting Oklahoma Wesleyan Eagles found no joy on their trip to Omaha as the CSM Flames achieved their second conference victory 4-0. Melissa King scored 2 goals in the first half in the 9th and 20th minutes. Tiffany Reis dribbled up from her center back position and scored an unassisted goal in the 29th minute. Jackie Swanger had zero saves first half. Mollie Jones was in goal the second half and had 2 saves. The second half started kinda slow. The Flames had the game well in hand and kept possession, but didn't get a whole lot of chances on goal. However, in the 70th minute, RaeLeigh Withey got the ball and saw that Senior Jessie McLaughlin was open in the box. Rae passed it to Jessie and she scored her first collegiate goal with a right footed shot past the keeper. Jessie had actually missed a penalty kick in the first half as well as missing the rebound. She was very frustrated that she missed 2 good chances in the first half to score her first CSM goal so she was pretty happy she scored in the second half. As a matter of fact, the celebration of that goal was so intense that RaeLeigh Withey was injured. Kira Cross and RaeLeigh were jumping up and down and Kira's tooth accidently came into contact with Rae's eyebrow and ripped it open. Of course, it bled a lot and Rae had to come off the field. Rae is going to have to get a stitch or 2. CSM had 26 shots and OWU had 2 total shots. The Flames' record is now 7-3-2. They are 2-0 in the MCAC. The next game is at Graceland in Lamoni, Iowa this Saturday at 5:30.